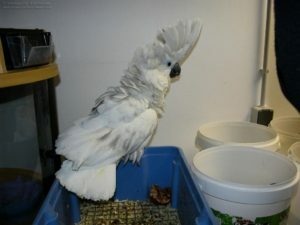 The Umbrella Crested Cockatoo, also known as the White Cockatoo or Umbrella Cockatoo, is one of the most popular of the Cockatoo breeds. His loving personality and friendly antics keep those who meet them entertained for hours. The Umbrella Cockatoo is highly intelligent, loving and affectionate. They love nothing more than to be snuggled and scratched. Though, like all parrots they can, and often will bite if they are inclined to do so. 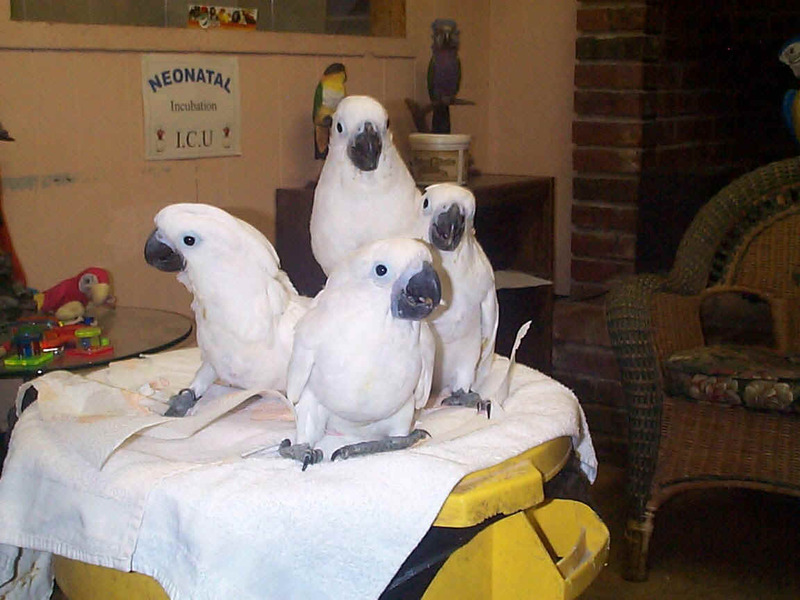 But in general, because their dispositions are so pleasant the Umbrella Cockatoo has charmed his way into many homes across the world. Though the Umbrella Cockatoo is not for everything. 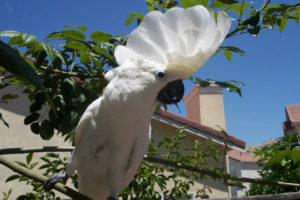 In addition to needing large amount of time from their owners, it should also be noted that like most of the larger parrots the Umbrella Cockatoo can be very loud. For this reason it is probably not well suited for apartment life as neighbors would likely complain. They enjoy chewing and should be given plenty of toys to curb their chewing. They are known for hard chewing and can destroy wood cages easily. They can become quite aggressive during breeding season and therefore care should be taken if they are placed near other birds at this time. It is not uncommon for them to seriously injure another bird during breeding season. All of this aside, the Umbrella Cockatoo does make a great pet provided prospective owners are aware of their needs. The Umbrella Cockatoo is a very large parrot measuring 18 inches (45cm) at maturity. One of the most charming things about the Umbrella Cockatoo is his smiling face. While they are not actually smiling their cute bills and sparkling black eyes give them a very happy appearance. They have striking white plumage which covers their entire bodies including their striking, broad crests. The crests are backward angled and rise to glory when they are so inclined. A yellowing base is seen on the feathers of the wings. It should be noted that most females will have lighter iris, usually reddish-brown. Immatures look like adult males. The young females will develop their lighter iris by approximately one year of age. It should be noted that at this time it is a grayish-brown. Most females also exhibit smaller heads and crowns. Native to Indonesia, the wild Umbrella Cockatoo prefers a variety of areas including mangroves, forests, swamps, and other areas with tress or tall secondary vegetation. While their numbers have been reduced due to decline in habitat and trapping, they are not yet endangered. The Umbrella Cockatoo is a large parrot and thusly needs a large cage. As is true with all parrots, they should be housed in a well lit, draught free area. Natural sunlight is a must for all parrots. If this cannot be provided, many vets will recommend using full spectrum lighting. Their cages should be filled with a wide variety of toys to help prevent boredom. These parrots also require a large amount of time with their human family. If you do not have a lot of time to spend, this is not the bird for you. These are highly social and intelligent animals. A healthy diet should consist of pellets, a good mixed parrot seed, green foods, fruit, eggs, and meat. 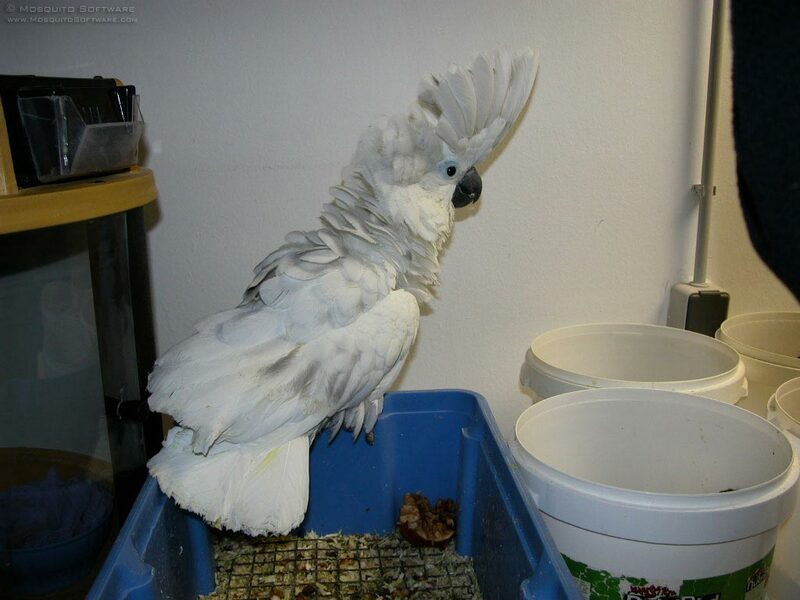 Most cockatoos enjoy eating whatever their human friends eat. Plenty of fresh water is also needed. A shower from a fine spray is enjoyed to clean the feathers, some birds will even have a bath. 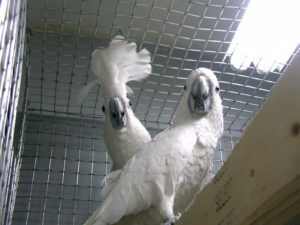 Male Umbrella Cockatoos can be very aggressive during mating season and therefore isolation of the breeding pair is a must. Breeding in captivity is regularly achieved. Breeding season will typically begin in the spring, though breeding has been known to occur at other times. The female will lay a clutch of 2 eggs, which incubate for 28 days. Fledging will begin after 11 to 14 weeks. The Umbrella Cockatoo usually makes a good parent.